Recently, I’ve helped several friends locate document review positions, with both my current company and agencies I’ve worked with in the past. Each time, I am reminded that everyone struggles with how best to list document review experience on their resume. In general, I am a fan of simplicity and reducing clutter. Where possible, it seems reasonable to compress multiple projects into a single block with one description and timeframe, especially if the projects were close in time and for the same agency. Treat each employer/agency as a single job, even if they have overlapping timelines. If you’re applying to non-review jobs, this compressed format helps show the consistency of your employment history. If your work history has a rather problematic timeline, consider creating a functional resume instead of a chronological one. With this format, you can list your skills and experience separate and apart from the individual jobs you’ve held. Any other feedback you received – were you ranked as a fast, accurate coder or invited back for second level work? If you did more than just code documents, point that out. 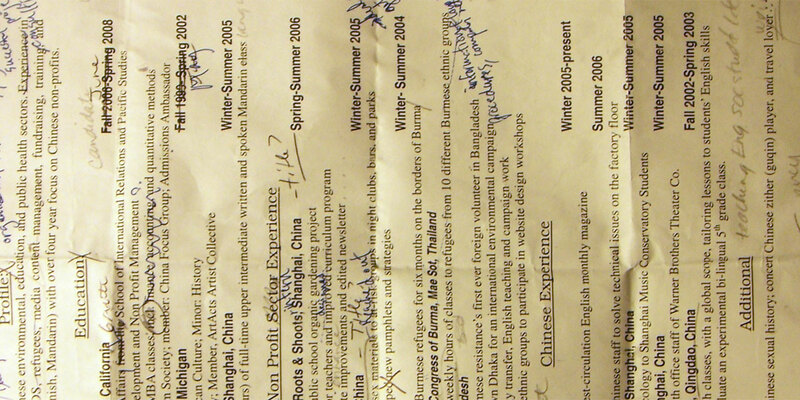 Skills that may be of particular interest to document review recruiters include foreign languages and computer or database skills. Be careful about getting in over your head, though. Just because you took an intro to Farsi course in college, you likely won’t be able to work efficiently in a review situation. Expect to have your language skills tested when you join a foreign language project. If you’ve never used any document review platforms, consider going through some of the online tutorials offered for free on company websites. Having some basic understanding of what to expect could help when you start a new project. For example, Relativity, Concordance and iCONECT offer free online training options. Those without free online training, like Xerox Omnix, might offer sales or other promotional materials you can use to familiarize yourself with the tool. Often, this information can be found in a “support” section of the company’s website. Don’t pass on a project because of inexperience with a specific platform, however. If you have any reasonable level of technical skills, you will likely be able to quickly master the platform with a small amount of training. One important thing not to do, however, is identify clients and law firms as employers or in your description without explicit authorization. While it is perfectly acceptable to say you worked at Law Staffers for an AmLaw 50 firm working on an admiralty matter for an international beverage manufacturer, Listing Anonymous Law Firm LLP or Major Shipping Services, S.A. as your employer is inappropriate (you should, however, provide such information during conflict checks as necessary). In a separate log, you should maintain a personal list of conflicts information. Here, you would want to track the start and end date, agency, case, client and opposing parties. When you’re asked to complete a conflicts form, this list will allow you to quickly (and accurately) provide the requested information. After a while, projects all seem to blend together. Remembering the name of a client from that weekend project last year gets difficult twelve projects down the road. Finally, it’s important to get a second set of eyes to take a look at your resume. Send it to a trusted friend or colleague in the exact same manner you will use for applications – for emailed copies you should always send as PDF unless another format is specifically requested. If your word processor doesn’t save to PDF, look for a PDF printer like PDF995. I like to personally save my file as Lyon, Mark – Resume.pdf. Recruiters will often save many resumes in one large folder – making certain yours has a unique name will simplify things for them. Resume image courtesy of Kafka4Prez. Valuable ideas – I loved the analysis – Does anyone know where my company can acquire a template a form form to fill in ?